ACTION’S SPEAK LOUDER THAN WORDS, NO MATTER HOW THEY SAY IT! The only thing Donald Trump is guilty of, is using his 1st A right, a right that has been trampled on severely by the left mostly. The reason why politicians fear him, is because he means business, Donald Trump is telling the ugly truth, and naturally people either can’t handle the truth and/or don’t want to hear the truth. A couple of months ago, I had a conversation with a woman, (I’ll call her Donna), who works part time @ my technology school I attended earlier this year, we talked about life & work, she’s about my age. During that conversation she brought up her boss who is a female, & the trouble she has had with her, legal trouble that is. Donna had climbed the corporate ladder once before, and now in this company where she works full time, but this time around she’s blocked by this woman on many different levels from succeeding, much less keeping her job. Suddenly while we are talking, Donna said “I would work for a man any day over a woman.” She said most woman in power are difficult people in the work place. Now I’m not going into that arena, & have my own opinion on the matter, but for sake of argument, let’s just say I don’t have an opinion on the matter. However, Carolyn my wife of 28 yrs, has been in charge previously, and her subordinates enjoyed her. Having said that, the reason I mentioned that is because gender doesn’t matter, a leader comes in all colors, shapes & sizes, don’t vote for a person based on their gender and or color, the soul inside that body has no gender, nor color, women know this better than men, “don’t judge a book by it’s cover.” Something my Grandfather use to say, God rest his soul. I think #Killary is a misandrist, a closet dictator, equivalent to Pablo Escobar, a dead drug lord from Venezuela, who is responsible for Vince Foster’s death, as well as those four brave soldiers who were murdered in #Benghazi 9-11-2012 on her watch. She has never answered for that crime. I’m a U.S. Army Veteran and I take that personally, those brave men fought for their lives that night, most of them for “13 hrs,” please see that movie b.t.w., I know most Veterans take that personally, and we all know all to well the politicians interacting, or causing chaos with the military. My wife & I are in dire straits financially right now, we can’t afford another 4 yrs of Obama through #killary. The blame primarily falls squarely on the Democratic policies brought forth from when they took over the house in 2006, over all causing inflation, the housing collapse, the DOW plummeting more than 50%. George Bush has been blamed, that’s because the democrats are very good @ pointing the finger @ the GOP blaming them for everything, but when you look @ the actual record, i.e. 2005 compare it to 2007, apples & oranges, clearly it was the D’s policies that destroyed our economy. Subsequently of course Obama manages to become elected, and he immediately got behind the minimum wage debacle, then bribed enough politicians to pass O’BOMB 0CARE, exactly what it became, a BOMB went off, and there was ZERO care. “The Affordable Care Act,” will go down as one of the largest tax increases in our history. During Obama’s he has maxed out the credit cards, the very same cards he blamed Bush for over spending, Bush pales by comparison, doubling our national debt, #20 trillion dollars. #Killary supports all of those policies, and she doesn’t address how we will pay that off, nor does she talk about how she will revive the economy, – that is anything that makes any sense. Donald Trump under his plan will dramatically cut our taxes, and like her husband 1992, will dramatically increase our taxes that will put us all on the Soup-line. The powers that be, Obama & Clinton never lifted a finger to rescue those patriots. that is treason, a #fact >>> read what the founders have to say by such a cowardly act, or no act for that matter. 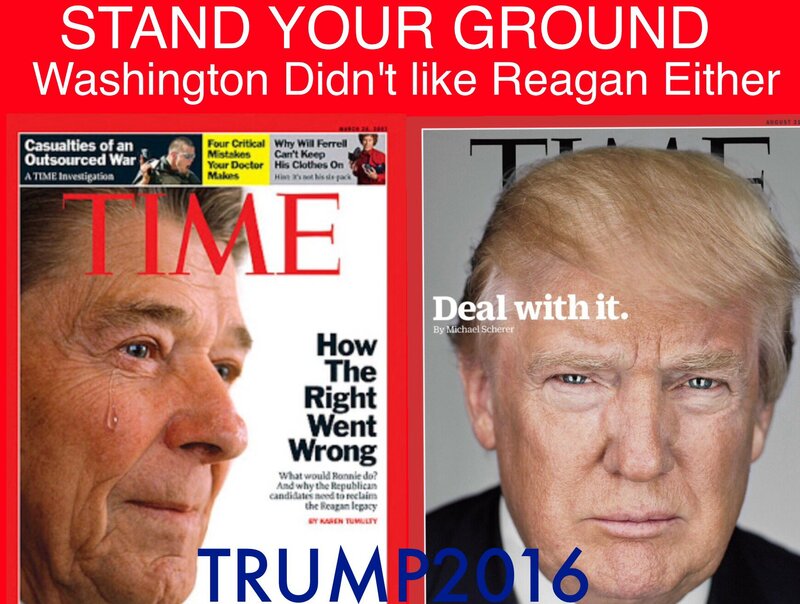 I know more about Donald Trump than most people, and Donald Trump is the finest of American’s as was Ronald Reagan. Ronald Reagan faced the same #propaganda and #rhetoric bc he was a former liberal democrat, an actor, but more importantly he was the closest to being a civilian as possible for a politician. He was called a cowboy, foreign leaders feared Ronald Reagan, as did politicians inside the beltway, they thought he would launch the nuclear warheads, as they R saying about Trump now. As a matter of fact there is a NY Times article which is a laughable joke >>> http://www.nytimes.com/2016/08/05/opinion/campaign-stops/i-ran-the-cia-now-im-endorsing-hillary-clinton.html?mwrsm=Email&_r=0 talking about how Donald Trump is a threat to our National Security, the same thing they said about Reagan. As you all know, Reagan went on to be one of the utmost Presidents since at least Abraham Lincoln. Ronald Reagan pulled our boys out of Beirut, as he should have, and brought peace between Russia and the U.S. Recently Trump has been ridiculed by the left wing media over his desire to unite the sovereign nation Russia with the US, instead of reporting/criticizing Obama’s 2 very expensive deals with a terrorist nation, and #Benghazi, which #killary crafted. Ronald Reagan became very good friends with Gorbachev, btw M.G. was a communist, but a president of a sovereign nation, all the same, in other words; not on the terrorist list. Lastly why isn’t anyone illuminating #HRC’s incompetence in the left wing main stream media?? I hate her condescending tone whenever she speaks, Carolyn & I won’t watch her when she talks, she is a rotten terrible person, I’ve done my homework on her for more than 20 yrs, her inner circle fears her, rather than revere her, her closest confident back in the 90’s was Vince Foster, WH lawyer, he was found dead in a public park with a suicide note, #Really? But let’s not get into semantics, how does #killary qualify to be President? Don’t tell me she’s a woman, PLEASE! New York use to be the melting pot of political incorrectness back in the day, today – well you know. B.T.W. #killary vacillates with political correctness, if you R #neverTrump then you R for HRC, plain and simple. Donald Trump is old school, that’s when America worked it’s best, now we need to bring back what worked, our country is at some cross roads, and people need to WAKE UP and get over it, pay attention, find the #facts, this is not a personality contest, this is about our country, our survival of independence. Think about the Veterans who served this country honorably, think about the ultimate sacrifice my brothers @ Arms paying the price of your freedom with their lives. Ask most Veterans who you think will take great care of this country, if they are honest, you will be surprised @ what comes out of their mouths.